Many kinds of music have spawned where the Missippi River empties into the Atlantic Ocean, in the multicultural city of New Orleans, and I heard some great performances of some of this music at the Smithsonian Folklife Festival earlier this month. The Mardi Gras Indians strut and play during two times of year in New Orleans, Mardi Gras and St. Joseph’s Day, and they prepare all year long. 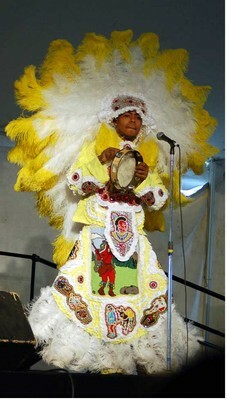 They are not Native Americans but African Americans who follow a tradition started around 1840 in New Orleans. They sort themselves into groups and rival each other by parading in elaborate costumes, called suits, and playing their own music. 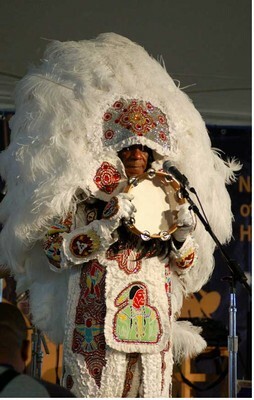 The current stars are Big Chief Monk Boudreaux and the Golden Eagles Mardi Gras Indian Tribe. Although I didn’t especially like the music, which has a very loud and unvarying rhythm, I certainly enjoyed watching Monk and his son perform. 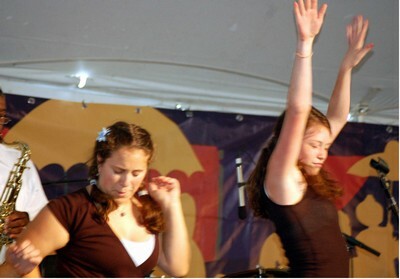 I love R&B, and I heard the Dixie Cups, one of the “girl bands” from the early 60s, whose biggest hit was “Going to the Chapel.” They are more than singers; they are entertainers in every sense of the word. Something about them reached out to the audience, grabbed us, and had us spellbound and excited. These ladies have real class. When you’ve got it, you’ve got it, and age doesn’t tarnish it. 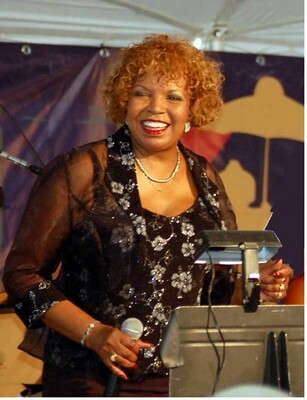 My favorite of the three singers is Rosa Lee Hawkins, age 62, and she has it in spades. She has a quality that I’ve only seen in African American women, a unique mixture of down-to-earth excitement and dignity. She is one of a long line of performers which includes Aretha Franklin and Oprah Winfrey. They inspired some great, high energy dancing. Near the end of their performance they tossed out handkerchiefs (actually Kleenexes) and Dixie cups to the crowd. 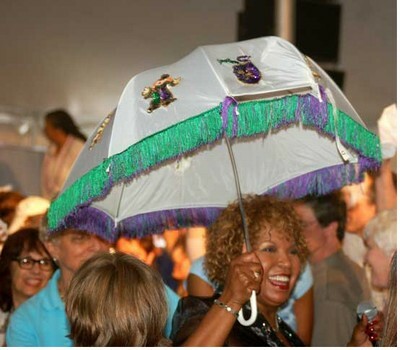 Miss Rosa Lee herself, carrying a parasol decorated with sequins and a fringe, led us in a Second Line dance, a New Orleans tradition, and we snake-danced behind her waving our handkerchiefs.